Investigative reporter Lowell Bergman views collaboration as a solution for the reams of information that public interest reporting produces. Investigative reporter Lowell Bergman often attributes his interest in collaborative reporting to his frustrations as a television producer at “60 Minutes.” With only 14 minutes of TV time for each report, there was a lot of information that fell onto the cutting-room floor. In response to this conundrum, reporters within tight investigative reporting circles would periodically share information and tips about stories destined for the dustbins. It was that surreptitious sharing that led Bergman to think that actual collaborations, particularly between broadcast and print organizations, would be a good idea. Today, “60 Minutes” and all of CBS’ news programs are integrated into a single news division. But what little news you can squeeze into 14 minutes of airtime remains the same. Because investigative reporting often produces a tremendous amount of information — sometimes too much information — it makes logical sense to collaborate. But before you jump in, there’s a lot to figure out. Where to begin? If I’ve learned anything about managing collaborative investigative journalism, it’s that planning matters. 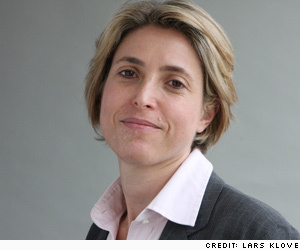 As ProPublica editor Robin Fields (pictured below) put it, if you “frontload” your decisions, “you can spare yourself at the end” — and, I would add, along the way. Tip 1: Set up a group email and calendar. This sounds obvious and outdated — email groups were a big innovation in 1998 — but as your team grows it’s critical to make sure that everyone is in the loop. More than once, a “Post Mortem” team member was left off of an email thread or hadn’t heard about an upcoming reporting trip. You can imagine the frustration. As long as someone is willing to manage the list and everyone has access to the calendar, these are (nearly) foolproof solutions. Tip 2: Set up a system for sharing information. In “Post Mortem,” the reporters shared almost everything: sources, interview transcripts, audio/video files, documents and data. The level of transparency was surprising, and sometimes difficult. When the psychological hurdles of sharing are overcome, there’s a more logistical quandary. Literally, how do you get the information from one reporter to another? Large organizations often have access to an FTP server, making it easy and secure to upload and share large files. If not, there are plenty of free and subscription-based tools — Google Docs, YouSendIt, Basecamp, Dropbox — that make sharing easy. Collaboration Central editor Amanda Hirsch wrote about the organizational importance of collaborative software in 2009. Two years later, her experience still holds true and there are even more tools to choose from. Set up a system from the beginning and make sure that everyone understands how to use it. It will eliminate a lot of back-and-forth requests, will ensure that everyone has access to the information they need, and will help the team stay organized (a useful thing when you get to fact checking). Tip 3: Decide how to track sources. How will the team know who has talked to whom, how to follow up with sources and any other key source-related information? With “Post Mortem,” we used a spreadsheet to document sources. The spreadsheet now comprises an unwieldy database of more than 250 contacts. The pertinent information is there, but a software solution like the web version of Microsoft Access would be preferable. The point is to recognize the need and set up a system that works for the collaborators. Tip 4: Know thy partners’ operating systems. These days, platform distinctions are a minor consideration, but some programs are platform specific. Know what computers, operating systems and software versions your collaborators use to identify potential glitches. I was recently having coffee with David Cohn, founder of Spot.us, to get his take on what journalists need in their collaboration toolbox. Doodle was his reply. 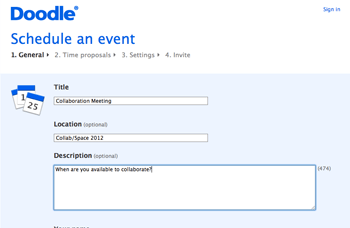 It’s a tool that allows you to poll participants to find the best time for a meeting, conference call or other event. It saves you from that incomprehensible thread of emails about when (and why!) people can and cannot meet. In short, it is brilliant. I’ve been invited to use Doodle a number of times, but hadn’t set up a Doodle poll myself until recently. Trust me, it’s easy. Finally, emphasize to your partners that planning matters. Putting these systems in place takes time and a small financial investment, but it will pay off in the long run. Carrie Lozano is a Bay-Area based journalist and documentary filmmaker. She is currently the project director for “Collective Work” a Knight-funded project about collaborative, multiplatform investigative reporting at the Investigative Reporting Program, UC Berkeley Graduate School of Journalism. She is also directing and producing a documentary film with Charlotte Lagarde about jazz pianist and composer Fred Hersch. You can follow her at @carrielozano. “Collective Work” is funded by the John S. and James L. Knight Foundation. Copyright 2012, The University of California at Berkeley.